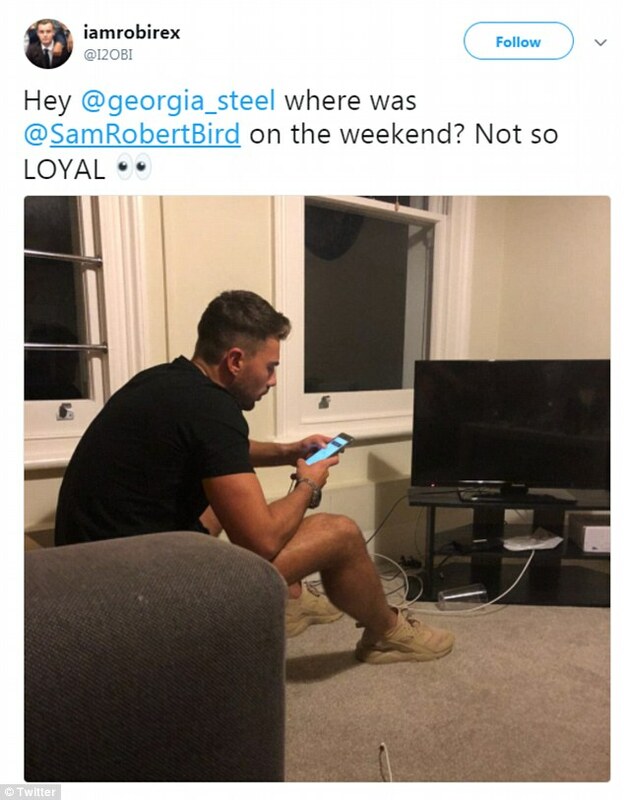 They split on Tuesday night amid claims Georgia Steel was unfaithful to Sam Bird. But in an exclusive interview with MailOnline, the Love Island star reveals she fell out of love with the hunk, was fuming that he went through her phone, admits to feeling trapped and insists she didn’t cheat – but DID sleepover at her ex’s house. Georgia admitted that while she knew for a while her relationship with Sam was over, she wanted to prove the public wrong, so stayed with him regardless. Georgia insisted: There was NO third party involved in the break up between him and I. Sam thinks I cheated because he went through my phone. ‘He read and took screen shots of banter I had between me and my best mate. Georgia admitted she hasn’t been completely innocent. She said: ‘I will put my hands up and say yeah I do admit I went round his house and stayed the night in the spare room but NOTHING did happen. ‘I’m honestly not like that. I went over to collect some things which he had of mine which I needed for the flat and then ended up having a heart to heart as I was very down as me and Sam had been constantly arguing. Georgia has implied there is now no going back for the former flames. She said: ‘He was a lovely boyfriend and I did really love him but moving in so soon and the public pressure did make me feel very trapped. ‘I gave our relationship everything as I really did want it to work and I was loyal throughout. But you can’t help your feelings. ‘I’m stubborn and wanted to prove the public wrong about me and him but the reality is it just didn’t work. Her words come a day after a source told MailOnline exclusively: Sam found out she had gone to her ex-boyfriend’s flat without telling him and he was pretty annoyed. 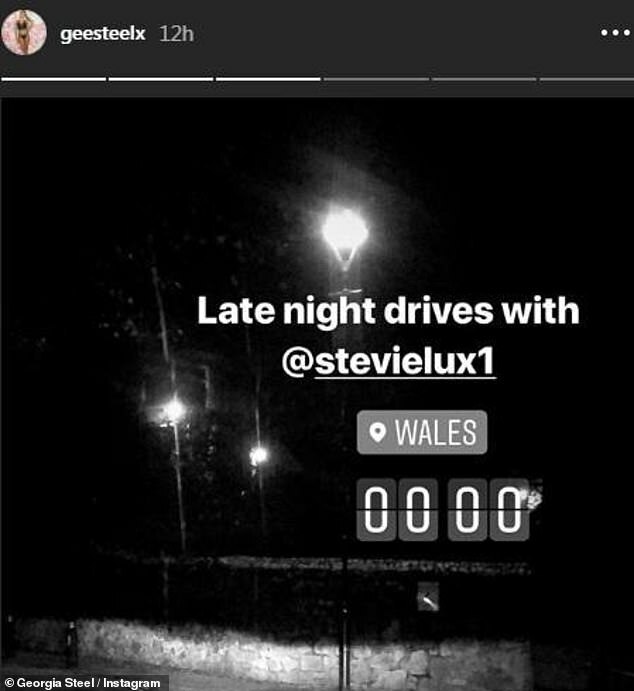 ‘He and Georgia had dated up until a few months before she went on Love Island and she still had belongings stored at his place from when they used to live together. Sam, 25, admitted how devastated he is about the split on social media but the source also told MailOnline the writing has been on the wall for a while. Amid the chaos, Georgia vehemently denied claims made by the Mirror Online that she was romantically involved with her tour manager Steven West. Steven West is a third man and not the ex-boyfriend Sam is referring to. The ‘loyal’ beauty made further claims a romance with West was ‘laughable’ as she reiterated he is her tour manager who drives her to her press days. 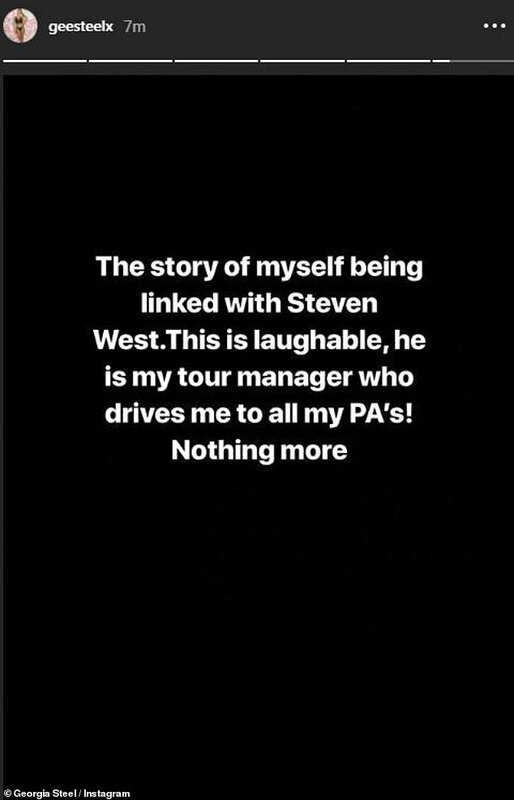 She wrote via Instagram stories: ‘The story of myself being linked with Steven West. This is laughable. Sam and Georgia are now the fifth couple from this year’s series to part ways, attended the ITV Gala just hours before Sam, 25, revealed their break-up on Twitter. Their split comes after the break-ups of their co-stars Laura Anderson and Paul Knops, Laura Crane and Jack Fowler, Charlie Brake and Ellie Brown and Samira Mighty and Frankie Foster. The duo met on Love Island over the summer and had been inseparable since leaving the villa, often attending glitzy events together. They embarked on a whirlwind romance and moved in together in Essex just weeks after returning home from Mallorca. Last month Georgia gushed that the hunk was her ‘best friend’ as well as boyfriend, while sharing loved-up snaps of them. ‘Thank you for being my partner in crime and always standing by my side. Not just my lover but my best friend too,’ she penned. Their romance was previously rocked when fans accused Sam of being at a ‘girl’s house’ while she was away. 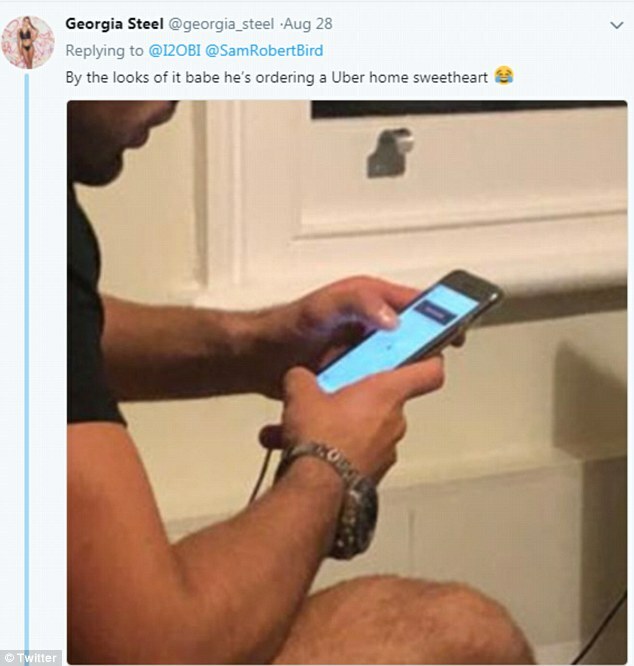 Georgia replied: ‘By the looks of it babe he’s ordering a Uber home sweetheart’ accompanied by a laughing face emoji. 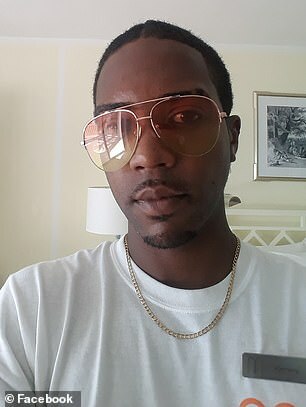 The pair struck up a romance in the villa after Georgia’s love interest, Josh Denzel decided to couple up with newcomer Kaz Crossley after they hit it off in Casa Amor. Georgia caused friction in the villa when she picked then newcomer Jack Fowler, who was coupled up with Laura Anderson, to go on a date with her, and then caused chaos when she kissed him at the end of the date. 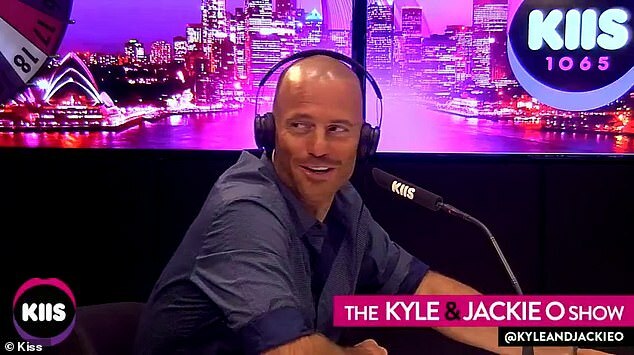 The plot thickened when Georgia and new Jack ended up offering different accounts of what actually went down, with Georgia saying the kiss was mutual but Jack saying it was unintentional. Kissgate worsened when host Caroline Flack oversaw a VAR breakdown of the kiss on After Sun, only for viewers to point out continuity errors in the playback of the kiss from different angles. Trying to set the record straight, Georgia has now admitted the kiss was filmed more than once. ALEX BRUMMER: If Brexit is such a disaster, how come Europe's firms have DOUBLED stake in the UK?